Did you ever find yourself thinking, "I wish I had invested in Pantaloon while it was still young?" Or even in Shriram Transport for that matter? But there was no way you could have known that sooner. Through Hidden Gems we're providing you opportunities like that today. There's no other authentic source of long term recommendations on such companies. And whatever else is available is biased. We understand that small caps may not comprise a big portion of your portfolio. But that doesn't mean you don't need to think about them at all. Small cap stocks of your portfolio does the key job of maximizing your returns. That's Why You Need To Be even more Careful in choosing your Small Cap Stocks. We launched Hidden Gems in 2010 with a view to provide profitable Small Cap recommendations. We have always said and still say that you should look at small caps from the long-term perspective. The stocks we recommend through Hidden Gems are strong companies and we recommend them not because we believe they will flourish in a month or two, but over a minimum period of 2 to 5 years. We reveal reliable small companies through Hidden Gems as and when they're available at a bargain, which gives you the opportunity to snap them up early and set yourself up for huge gains when these stocks soar. However, considering the risks that small companies carry, you should realistically not expect each and every recommendation to be an out and out winner. Moreover, whenever the market crashes, small caps are the first to bear the brunt of it. So risk taking is required to a certain extent when investing in small caps. Every month we will notify you of an exciting small cap opportunity. The research report we send will tell you why we think this stock would be a good buy at that point, and it will also clearly explain the pros and cons of investing in that company. 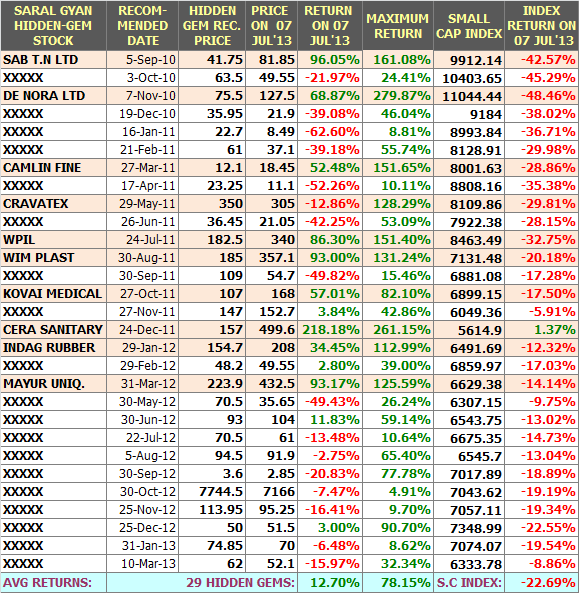 Below is the performance of last 29 Hidden Gems stocks recommendation by team of our equity analysts. Our team has suggested profit booking, buy on dips and exits from many of these stocks based on their performance and fundamental analysis. To know more on our Hidden Gems Subscription Charges - Click Here!